Instagram is my OBSESSION and my favorite social network to date by far. I love it. It’s so simple and easy to use. It isn’t cluttered with this feed or that feed or this ad or that ad. It’s clean and nice on the eyes. It’s easy to follow and unfollow folks depending on your tastes and interests too. So, if you are not familiar with Instagram yet, it is essentially a platform that allows you to share photos and short videos that look like a professional photographer took them. I like to explain this platform like this…It tells the story of your life and/or business through photographs and video. Other perks are that this it is very easy to get noticed as well as make new connections. Being active on Instagram has brought me contacts, business partnerships, new friends and so much more. It is an amazing platform and it is on the rise in a BIG way. I love this platform for brands, fun products like clothing, jewelry or the like as well as personalities, public figures and more. So, today I am going to share 6 tips that will help you grow super FAST on Instagram for your business. We’ve all heard it before and there is definitely a reason why they call them Social Networks….because the key is to BE SOCIAL! However, so many of us are missing this concept and making this way more difficult than it needs to be. I promise there isn’t some super duper secret magical formula that you need to discover when it comes to this. Typically what I do is find someone that I love to follow that also works in my niche and has a much larger following than I do and then I take a good peek at who they are following and who follows them. I go through their fans and then pick and choose who I want to follow and connect with. (Now, one thing you definitely DO NOT WANT TO DO…is write a comment to them plugging your clothing and telling them to check you out…that is called SPAM and feels so ICKY.) Be casual, be genuine and like what you like. Believe me, if you have cute clothing and a great business people will want to follow you and ultimately buy from you as well. Hopefully you get my point here. Each day share photos from Instagram onto your Facebook and Twitter networks. This will create a link back to your Instagram photo on your profile. 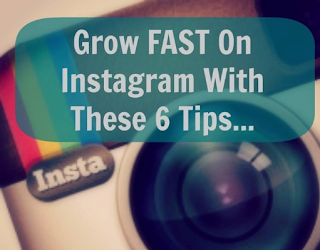 This is a great way to attract more fans and followers from your other networks that are active on Instagram too. A great way to get a large jump on attracting new followers is to email your current clients, customers or leads and ask them to join you on Instagram. Make sure you give them great reasons to follow you, like..you will be the first to see our new lines of clothing on Instagram or you will be the first to receive a special coupon code. The key is to give them an incentive and reason to join you there. There are several ways you can run a contest. You can run a contest with a special Facebook App that gets folks from Facebook to follow you on Instagram. You can again email your list and run a special contest that encourages folks to follow you. You can partner with another complimentary businesses and encourage their fans to start following you. The choice is yours and let your creativity soar. But, contests are a great way to grow and attract new followers. I don’t recommend over doing this unless your company or business is well known for discounting and promotions. Now let me suggest a platform that will help you create dynamite promotions on your social networks. I recommend using TabSite to create and manage your contests. This company offers an affordable, easy, and powerful way to engage new fans and boost revenue too with contests and promotions. Just like on Twitter and Google +, Instagram is great when it comes to using hashtags. The key here is to understand what are your top 10 hashtags for your niche or business are and use them appropriately with your photos. Now, if you are posting a photo of a cup of coffee, you probably don’t want to use a hashtag related to your niche or business unless you are specifically drinking the coffee to wake up and work. Get the drift. Using them authentically is key. In short, Instagram is fun, hot and works great for brands and businesses. Get in there and have some fun while growing your network! *** Remember…BE SOCIAL & BE GENUINE! People can smell it if you only WANT something. Lead with giving and you will receive! Amanda Brazel - Author - Thanks for this great article!